It is our strong belief that when these aspects of the game are taught without introducing the element of contact, young players will be better prepared to play the game in the future. This is an instructional and developmental league with a secondary emphasis on competition. The noncontact rule will be strictly enforced by the coaches/referees. Teams will consist of approximately 9-12 players. Good fitting athletic shoes – molded cleats are allowed. the 10-yard line to create a new goal line. touchdowns in last 2 minutes of each half. initial offensive possession of the second half. Each team is allowed four downs to make a first down or score. 15 yards for a first down. ensuing extra point try. If the game is still tied, it will be recorded as an official tie. 6 offensive and 6 defensive players and one coach from each team are allowed on the field. A new backfield must accompany each offensive series. Coaches are encouraged to huddle their offense quickly and start a new play in a timely fashion. A 45 second time limit is enforced between plays. The coaches on the field are to work together to referee the game. Players must play half of the game on offense and half of the game on defense. With every new offensive series, players should play different offensive positions. 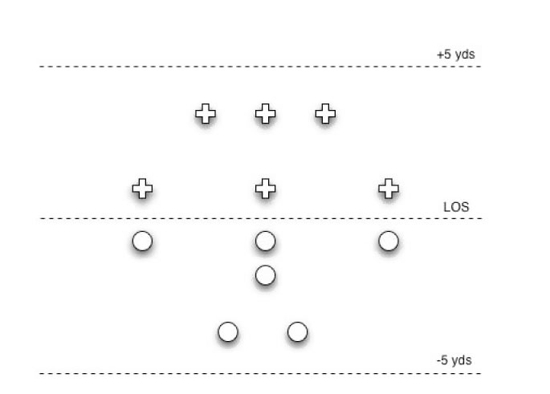 Over the course of a game, try and rotate all players through all 6 offensive positions. should be under center for a direct snap. Quarterback will call signals to initiate snap. Once the ball is snapped, the coach/referee shall start a 3 count. count may be retrieved and play continues. Once the 3 count is reached, the defensive team may cross the line of scrimmage. this occurs, the defense is allowed to cross the line of scrimmage. dropped pass, or a score. team which scored the safety). All players on offense are eligible receivers. Including the quarterback. There must be 3 players on the line of scrimmage. The quarterback must take a direct snap from center. Only one player is allowed to be in motion at a time. Picks and screens on pass patterns are illegal. At least one foot must be inbounds when making a reception. permitted. If contact is made, the offensive player should have their feet set as in basketball. shoulders (normal blocking technique applies). All offensive players, except the quarterback, must be in a 3-point stance at the snap of the ball. No stiff-arm or slapping away defenders arms. Penalty: 5-yard from infraction. avoids players going into a pile to retrieve the ball which may cause injury. A fumble caught out of the air or deflected pass may be advanced by either team. 45-second time limit between plays. Defensive players may not initiate contact. tackle. Pushing or tackling: 15-yard penalty from infraction. high over their head. This is for spotting purposes. referee: 5-yard penalty from line of scrimmage. Defensive players may play man-to-man coverage. five yards from the line of scrimmage. Kick-offs to start each half and after touchdowns will be from the 50-yard line. where it was first touched, and the return team will begin with first down. No onside kicks are allowed. Kickers and punters shall be alternated during a game until each team member has kicked. A team must declare whether they will punt on 4th down. The center shall attempt a long snap to the punter five yards back. No rush shall be attempted. must avoid blockers and may not make contact with the return team blockers. the quarterback not in 3 point stance -- 5 yard penalty from line of scrimmage. penalty from line of scrimmage and loss of down, after first warning.